Ohorongo Otavi Community Trust (OOCT), in collaboration with Support Ulm e.V. secured 1100 (one thousand one hundred) tubes of sunscreen lotion for persons with albinism in Namibia. Ohorongo’s PR and Corporate communication, Manager Esther Mbathera, handed over the tubes valued at N$ 130 258.00, to the Oncology Department of the Ministry of Health and Social Services recently. “OOCT, in collaboration with Support Ulm e.V. has committed an additional 1500 tubes for this year. 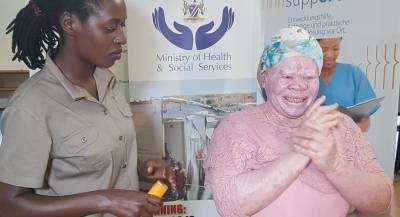 We hope our contribution will go a long way to prevent sun-related cancer, which can cause early death amongst people with albinism,” said Mbathera. The lotion has a special active ingredient which provides reliable protection for the skin cells against the scorching Namibian sun. The Ministry of Health and Social Services will distribute the lotions to the affected people, and those raising children with albinism. 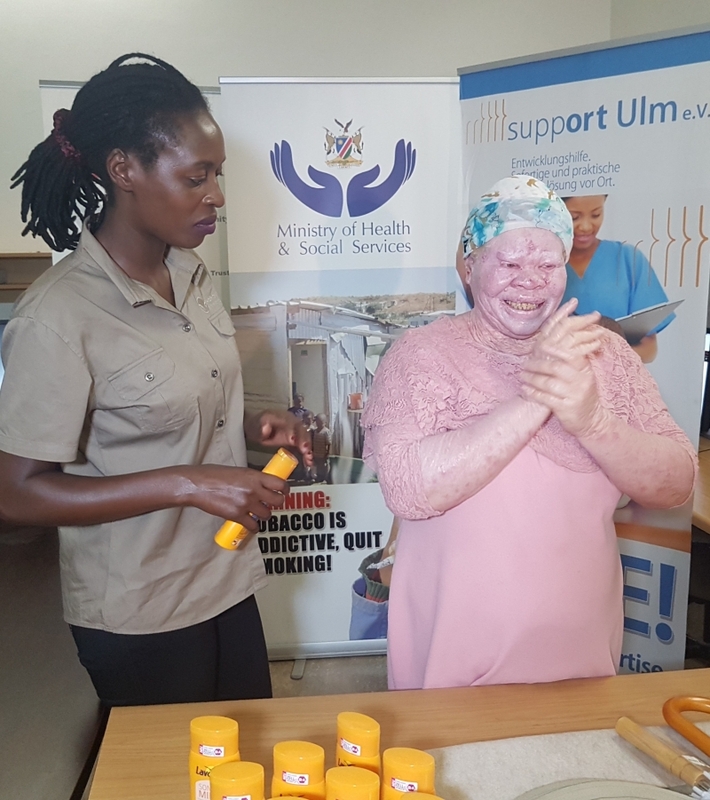 “We can prevent skin cancer among persons with albinism, if they can get help early, especially if parents bring the children to the medical facilities at an early age,” said Dr. Peggy Mvula from the Oncology Department. Dr. Peter Stoermer, of Support in Namibia of Albinism Sufferers Requiring Assistance (SINASRA), received the lotions from OOCT / Support Ulm e.V., saying the donation came at a time when the Central Hospital (responsible for distribution), was running low on sunscreen lotions. “We are very grateful to receive these lotions from Support Ulm e.V., which is special in its formula, and is suitable for persons with albinism. There are some sun lotions which will not withstand the heat we have in Namibia,” said the grateful Dr. Stoermer. SINASRA's primary concern is the survival of people with albinism, ensuring their livelihood and offering them a fair standard of living. Namibia has a population of over 2000 people affected by albinism, and all of them are in need of sunscreen, due to the very sensitive nature of their skin. 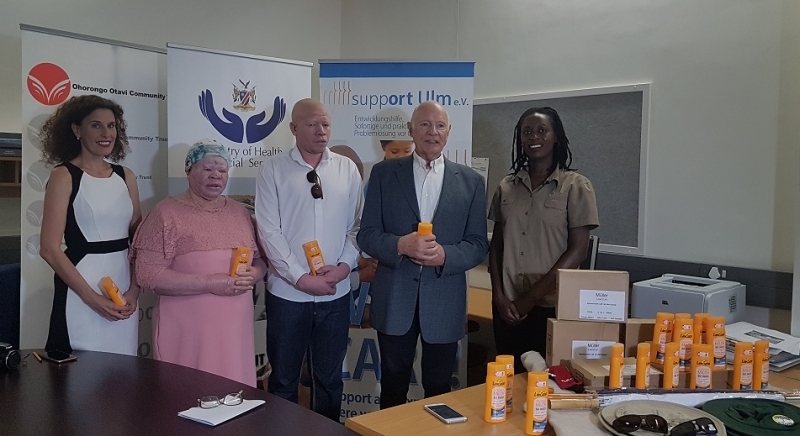 The donated lotion will be given to people with albinism free of charge by the Oncology Department at the Windhoek State Hospital, and various other centres countrywide. OOCT & Support Ulm e.V. has been supporting SINASRA and persons with albinism since 2015.